I finally took my daughters to see Fiddler on the Roof after all these years and discovered, to my tear-stained enthrallment, that the show is actually about them. I thought I knew Fiddler. It was the first Broadway musical that I ever saw -- the "original," with Zero Mostel. It still plays in my head, or I should say, he does. My daughters, Lea and Sara, who are now ten and thirteen, have grown up with these songs playing in our home (as I did) but I resisted showing them the movie, which is powerful but painfully realistic. 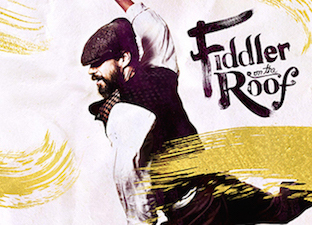 I wanted them to see Fiddler first on a Broadway stage, as the musical it was so eloquently conceived to be. At last, with this new production, directed by Bartlett Sher, it was clear that the moment had come. We sat somewhat separated from one another at the Broadway Theatre, which sometimes happens when I'm generously handed two press seats and then buy a third; the seats are not always together. On this occasion, however, the division was almost perfect -- I was one row behind the girls and two seats over, stage right. As a result, I wound up watching them watch the show, as I watched. Anyone who has seen Fiddler knows that Tevye the milkman has five daughters. The title of the Sholem Aleichem collection of short stories upon which Fiddler is nominally based is, in fact: Tevye and His Daughters. The eldest three are the focus of the action. The story of their respective betrothals is the story of the degrees of separation that inexorably divide Tevye from his beloved girls; the degrees of independence that increasingly sever the bonds of tradition binding Tevye's daughters to him. I knew this, of course, but I never felt it so poignantly as I did on this night as I watched Fiddler on the Roof unfold framed by the faces of my own daughters. I witnessed their reactions as I registered my own. We were there together and we were there alone, simultaneously. As I began to tear up, surrendering once again to the exquisitely wrought wedding of Tzeitel, Tevye's eldest, and the strains of "Sunrise, Sunset" -- the most perfect song about parenthood ever written -- I could see my girls mesmerized by this same scene for the first time. I could see what young ladies they had become, how grown up they looked sitting there on their own, "seedlings turn[ed] overnight to sunflowers, blossoming even as we gaze." I could go on like this but you get the idea. I thought that Fiddler was about "Tradition." And it is. I thought that Fiddler was about the dissolution of a community, and it is. I thought that Fiddler was about Tevye. But it isn't. It's about Tevye and his three daughters. It's about how Tevye loses his daughters, to different degrees -- as we all do -- and moves on. Danny Burstein captures all of Tevye's talmudist bluster and surprising depths of his paternal possessiveness and desperation, without losing any of the character's inherent sweetness. If he isn't as funny as Zero Mostel -- well who is, or ever was. Jessica Hecht as Golde is tough as nails, harkening back to Norman Jewison's tough as nails film adaptation, yet she finds the maternal fear and the exhausted vulnerability at Golde's core. 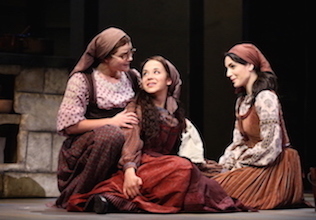 The three actresses portraying Tevye's eldest daughters (respectively, Alexandra Silber, Samantha Massell and Melanie Moore), to their great credit, were utterly engrossing as performers and as sisters. This Fiddler sounds and looks beautiful. I've never heard the score played with more luster than Ted Sperling draws from the orchestra. The dervish-like spin that Hofesh Shechter has given to Jerome Robbins already sinuous original choreography is spiritually dizzying; chasidic figures swirling in space and time. Bart Sher -- of whom I am a fan -- has chosen to begin Fiddler with an interpolation of his own. Danny Burstein first enters beneath an aged Antatevka sign dressed in contemporary casual, a guidebook in his hand; clearly a 21st Century tourist on a Jewish roots pilgrimage to his ancestors' vanished village. With the appearance of the Fiddler himself, Burstein slips off his parka to reveal Tevye in his "tiny prayer shawl" as the show truly begins. I had no objection to this framing device. It didn't add a whole lot or detract either. In the end, the curtain falls on this wandering tourist once again. By that time, however, I had another vision entirely in my head. Having wept silently through Tevye's farewell to his second daughter, Hodel, on the railroad platform that will send her "Far From the Home I Love," journeying to join her "radical" husband imprisoned in Siberia, most likely never to be seen again; having gasped in empathic pain as Tevye banishes his third daughter, his darling Chava, for the shocking crime of having fallen in love with a non-Jew, a native Russian -- having endured all of Tevye's losses, I suddenly found myself yearning for a different framing device. I saw three girls in parkas, guidebooks in hand. I saw them appear, separate and alone, from three different directions; the descendants of Tevye's lost daughters. I saw them come home -- if only for an imagined moment or two.